Because the waves emerging from a laser pointer are in sync, the beam can travel a long distance without spreading in all directions—unlike light from the sun or from a light bulb. In a standard optical laser the properties of the light output are controlled by the material from which the laser is made. 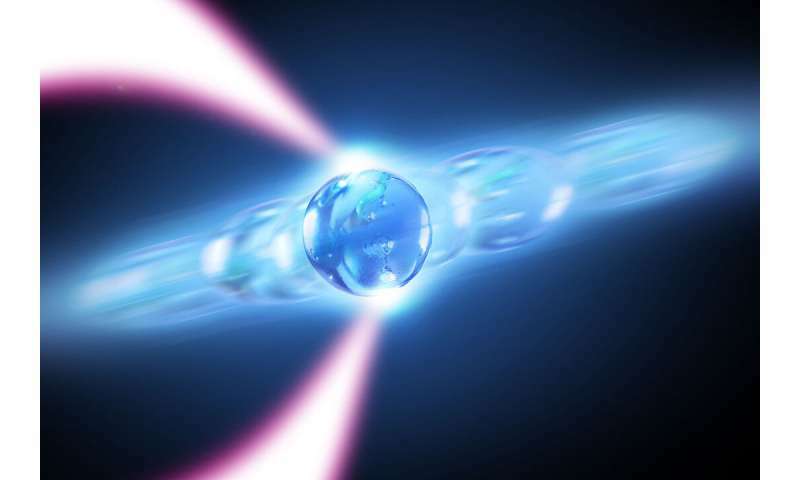 Interestingly, in the phonon laser the roles of light and matter are reversed—the motion of the material particle is now governed by the optical feedback. "We are very excited to see what the uses of this device are going to be—especially for sensing and information processing given that the optical laser has so many, and still evolving, applications," said Bhattacharya. He also said the phonon laser promises to enable the investigation of fundamental quantum physics, including engineering of the famous thought experiment of Schrödinger's cat, which can exist at two places simultaneously. Bhattacharya collaborated with the experimental group led by Nick Vamivakas at the Institute of Optics at the University of Rochester. Bhattacharya's theoretical team on the paper consisted of RIT postdoctoral researchers Wenchao Ge and Pardeep Kumar, while Vamivakas led current UR graduate students Robert Pettit and Danika Luntz-Martin, former graduate student Levi Neukirch and postdoctoral associate Justin Schultz.